A new apartment is a clean slate. It offers a fresh start for design, but you also have to work within the limitations of your rental space. As you begin to think about decorating your apartment, the goal is to find the right balance between functionality and design. You want to create a place that you will be comfortable living in, with items that fit your needs while highlighting your personal style. Here are 10 design tips to help find the right balance. I often like to begin with choosing the piece that will anchor the room. The rug is a great place to start and can create and define zones for each area of your space. The rug creates a grounding base and creates stability on which to build out your room. The color palette can emanate from the rug. The style, color, size and shape all come into play when selecting your rug. 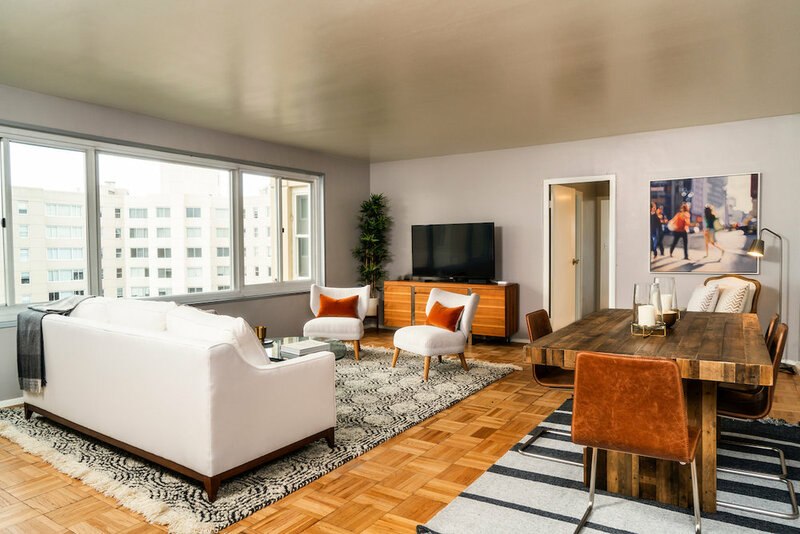 Often times, apartments have existing wall-to-wall carpet in a neutral color, which can be layered with a thicker, textured rug that can add enormously to the success of the room. You could start with a foundation of neutrals and add in one feature color and one metallic, like chrome, gold, or brass. 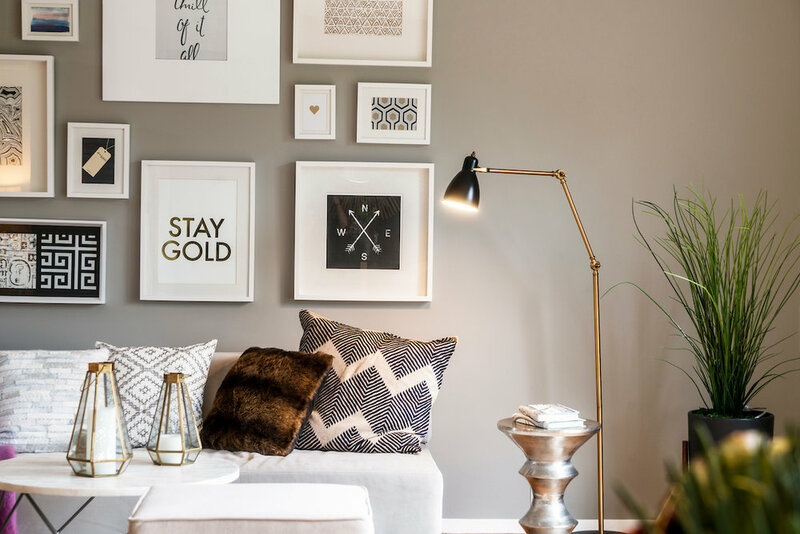 Sprinkle in metallics with the addition of a shimmering lamp, light fixture or decorative object that will reflect light and brighten the space. Invite in various textures and finishes with your furniture pieces to add depth while remaining light and airy on your eyes. For instance, if your sofa is very neutral you can choose to add boldly patterned pillows and a textured throw blanket for a more dramatic effect. When selecting furniture for a small space opt for airy pieces. Instead of a solid wood coffee table which can weigh down a room, choose a see-through acrylic or glass top with an open base that can disappear into the space. Choose a pedestal dining table that feels lighter and less leggy. If possible select furniture that is easy to move, and rearrange as the room function changes. Many apartments tend to be box shaped, but you can use your furniture to add some curves back in. Curvaceous furniture will keep things from looking monotone. Think about using a round or oval dining table or a sofa and set of chairs with angled sides. One of the best ways to freshen a room is to give the furniture a new layout. Consider angling some of the pieces in a new direction. It can be as simple as rotating the chairs towards the view or moving the ottomans to a new location. Once you have found pieces that suit your needs make sure to compliment those curves by using similar shapes in your accessories. Opt for round mirrors and curved floor lamps. Using a pair of ottomans in place of the traditional coffee table is a clever way to provide additional seating when necessary. They can also function with a tray as a sturdy place to set a cup of coffee or, be styled with an array of books and decorative objects. They are easy to move and rearrange as necessary. A daybed is a multi-use piece that can function as both a sofa and sleeping area for your guest and adds increased flexibility and functionality to a study, guest room or a living room. Choose furniture with space to store objects. Perhaps your bench has a bin underneath or a space with cubbies, your ottoman has a removal top with an empty base inside to store blankets. You may have a coffee table with a shelf below. Back of the door shoe hangers offer pockets that can be used to hold anything from cleaning products to workout clothing. Creating additional storage is one of the key ingredients to decluttering your home. Mirrors are the best way to add sparkle and add dimension to the space. Place a mirror opposite a window and it will reflect light around the room and make it feel airier. Multiple mirrors have a dramatic impact reflecting any and all light available in the room. With floor space being at a premium, opt for floating shelves in lieu of a bookcase. Keep them the same color as the walls for a sleeker look and don't be afraid to get creative with the sizes. Have fun staggering them to create a unique arrangement. Then, look for a variety of paintings, framed photographs and decorative objects to fill in the space. You can easily swap out the imagery and freshen up the displays without having to drill another hole into the walls! Placing your lights at multiple levels via floor lamps, chandeliers, task lights and up-lighting not only a creates a pleasant mood but, also allows you to highlight your favorite objects. Lamps are available in an array of finishes, materials, voltage levels and shades with various color, shapes and fabrics that not only add sparkle to the space, but they can also be sculptural and decorative themselves. Your kitchen is a room too, and when it’s open to the other living areas it becomes part of the decor. Keep the space airy, bright and clean. A woven basket that is also functional for storage is a beautiful addition above the refrigerator. A simple ceramic bowl containing fresh fruit is best way to add color. Adding an area rug that is easy to clean can add a bit of cushion while you perform your kitchen tasks. Keep countertop clutter to a minimum. Organize your cabinets. Keep the pantry items separated from your dishes and serving platters. Create in-drawer storage solutions. 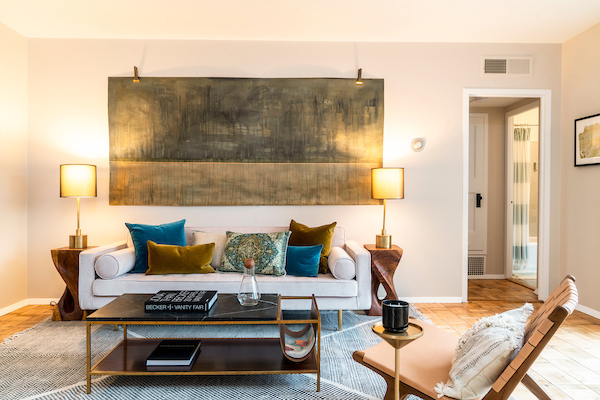 These images all reflect designs in Bay Area apartments, proof that it is possible to paint your own beautiful canvas on that ‘clean slate’ apartment you’ve rented. A few simple design tricks can make your new home look great, and feel comfortable to live in too. Jean Larette is a Bay Area designer, named one of House Beautiful’s Top Designers in America. 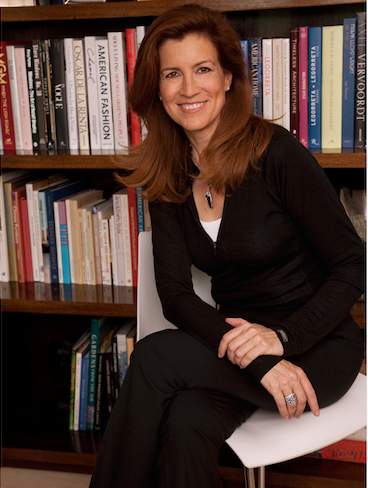 Her work has been featured in Architectural Digest, Elle Décor, California Home & Design, San Francisco Magazine, and other prestigious publications. She was the design and color consultant for the Pottery Barn ‘Home’ coffee table book. She speaks regularly on the topic of design, and taught a UC Berkeley course on ‘Layers of Luxury - Creating your Own Style’.